Situated in the heart of Southern California Wine Country’s Temecula Valley and backed by the Santa Ana Mountains, Lorimar Vineyards is a Tuscan-inspired estate, surrounded by sweeping vineyards and citrus groves. You can enter this stunning property along their tree-lined drive to an open piazza where your guests will be greeted for the start of what is sure to be an exceptional wedding experience. 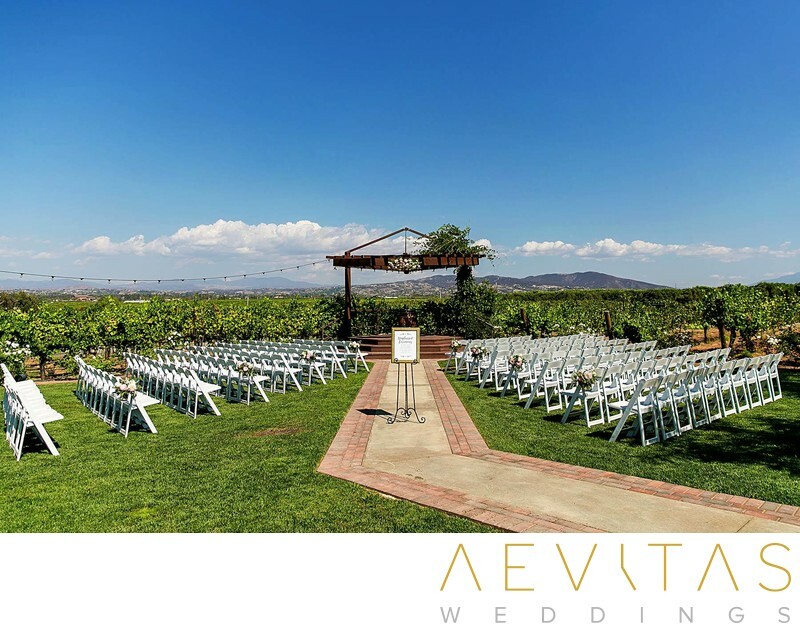 Exchange vows on their magnificent vineyard lawn, backed by viognier and cabernet vines, which accommodates up to 300 guests. With its bridal arch and rustic stone walkway, it boasts a whimsical ambiance and undeniably spectacular setting. Or opt for a more intimate celebration on their Barrel Room lawns, with its rustic adjacent reception space that can seat up to 150 guests. Take advantage of the breathtaking sunsets and late-afternoon golden light during your cocktail hour, with elegant white tents available if the weather forecast is unfavorable. There are plenty of Tuscan-styled architectural elements to incorporate into couple portraits, while the never-ending vineyards provide a stunning backdrop for bridal party portraits and family formals. Once the sun sets, romantic fairy lights illuminate the venue, creating a dramatic setting for nighttime couple portraits. Lorimar offers highly experienced on-site wedding coordinators to help you plan every aspect of your day, with numerous menu options provided by their expert catering team as part of their all-inclusive wedding packages. You can indulge in local, premium wines, grown in the surrounding vineyards, and feast on locally-sourced artisan produce, with menus customized to your individual desires. Lorimar Vineyards is an idyllic location for couples wanting a secluded, intimate-style wedding celebration, with the possibility to extend your day into an indulgent long weekend of wine tasting and gastronomy with your closest family and friends.